KS Engineers, P.C. (KSE) provided a complete traffic sign inventory, assessment, and implementation of a completely web-based sign management system for approximately 50,000 traffic signs in the City of Newark, NJ. The scope of work included the creation of a video log using a five-camera, van-based, GPS 360-degree data collection (GEOVISTA) system, a visual condition assessment, attributes extraction, a nighttime retroreflectivity assessment, and preparation of a priority report for the sign replacement and elimination project. KSE’s scope also included the creation of a state-of-the-art sign inventory and management system and integration of the system with the sign design and cutting facility at the Newark Sign Shop. The software of choice was the SignCAD/SignTRACK system combination. The system is completely web-based and field data updates are accomplished through the use of an iPad with custom developed Apps. 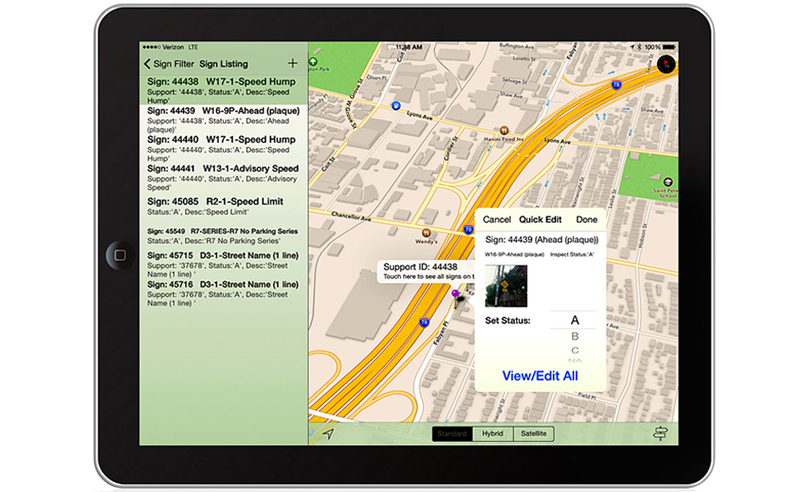 The iPad’s capabilities include displaying signs on Google Maps, as well as on an ArcGIS base map, by connecting to ArcGIS online or an ArcGIS server. In addition, the SignTRACK sign management system has a built-in work order management system to track and report all sign replacement or repair tasks.